Me and 7 others hired a motor boat for a day and went here. it's a truely stunning place. we swam about and into the caves and got icecreams from the bar-boat (genius idea). Didn't see any turtles at all. i think it's a myth. This was the best day out. Me n 20 of my friends hired 3 speed boats costing 10 euros each for 2 hours and went to the island.we are aged 17-21 and we loved it best trip of the holiday.amazing swims in the water and a beautiful little beach to relax on had a really good day.the speedboats are slow but it was still worht it.some of it is out of bounds because of ther turtles but you are still able to look around and swim in the caves. 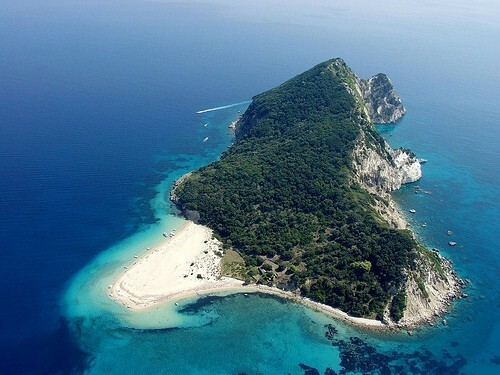 would deffo reccomend to visit this island. My boyfriend and I hired a motorboat at Keri beach for a couple of hours and went around turtle island. It only cost us around 25 Euros.Also stopped at the beach which was fantastic! It felt like we were on a desert island, the water is fantastic, clean and crystal clear! It is one of the best places I have ever been! The guys who hired the boat to us (I think it was called Dolphin water sports) were a great laugh, we sat with them for half an hour while waiting for a free boat and they were so friendly and welcoming.They also showed us everything we needed to know like how to get the motor running and so on and you dont really need any previous experience to hire a small motor boat. The island is technically 'off limits' to tourists. This should be made public as the during the months of May and June is when the Loggerhead Turtle is nesting. No landings should be made on the Island and CERTAINLY no speedboats used during this period as the injuries received by the turtles on their return to the island to lay eggs can cause them to die very slowly and painfully. Imagine being left to float in the water after having your leg ripped off by a powerboat rota blade, trying to reach land so you can lay your eggs but can't so you have to release them in the sea where they will ultimately die . In turn this all happens after you have swum for thousands of miles to get back to where you were born only to die in the most horrific way possible. Any trips to view the turtle should be made on a large boat, quite high out of the water so you can see the turtles without having to make them dive, or NOT have the owner of the boat or guide who is with you lift them out of the water, which distresses them greatly. PLEASE take care when choosing which boat trip to take and think about what harm you may be causing to the Turtles .. it is down to us as tourists and responsible humans to look after something which has been here on this planet far longer than we have and we are managing to wipe them out without thinking!! PLEASE dispose of your plastic bags and water bottles when you get back to your apartments/hotels, Turtles see these floating in the sea and think they are Jellyfish which is what they feed on, grab one and then end up with it stuck in their mouths or in the stomach and again die a horrible, slow agonising death I have made 5 trips to Zakynthos and I have seen turtles from a boat run from Dionysos Tours with Graham as the guide - very informative and passionate about saving Caretta Caretta - please help follow these simple rules and maybe our children and grandchildren will be able to enjoy these magnificent creatures in years to come. We hired a boat from the beach in Laganas and took a trip over to Marathonisi, the boat was slow but it was a great journey and the beach at Marathonisi is stunning. The water is so clear and clean over there too and didn't appear to be as salty as the sea at Laganas. There is a little speedboat that sails round Marathonisi and calls itself a bar boat, he sells ice cream, rolls, juice water etc..... and is a really cool idea. Heading round the Island and going to the caves is awesome and there is a little pebble beach that you can top up your tan on. Only a short trip from Laganas but it feels like a million miles away when you are there, we took a picnic and spent a few hours there and had a great time - would recommend a trip here to anyone!!!!!! Liked it that much we went twice. So peacefull and clean. Do you need any previous experience with boats in order to hire a speedboat to get to the island? We hired a motorboat from Keri: Well worth the trip out to the island: There are 2 beaches you can stop at: One of the beaches, below rocks has some excellent snorkelling around it, you can swim into the adjacent caves (watch out for other boats!). After taking a turtle-spotting trip around Marathonissi, my wife and I decided to hire a speedboat. I would recommend it to anyone! We got the boat from the beach at Laganas and even though it was a slow trip out we enjoyed it immensely. We went into the caves at the back of the island then stopped off at the shingly beach. The water was crystal clear and there was a way to get into the caves mentioned previously. Nice. You can stop off at the sandy beach at the front too but you have to be careful of the turtle eggs there. I RENTED A BOAT WITH MY GIRLFRIEND FOR THE DAY, FROM LAGANAS, AND WENT THERE. ABOUT 20 MINUTES WITH A LITTLE 10hp MOTOR. NOT MUCH TO DO ON THE LITTLE ISLAND AS THERE ARE NO SHOPS OR PEOPLE. BUT IT WAS A GREAT BOAT RIDE GETTING THERE.